Dwayne “The Rock” Johnson is a jack of all trades. The wrestler, turned actor, turned all around media personality is involved in anything from major blockbusters to major pitfalls. With 3 films currently shooting, and one just released starring the comic genius that is Kevin Hart it’s a wonder the 6’4 Samoan gets any sleep. Well he does, he just gets up around 3:50 every morning – and now you can too. 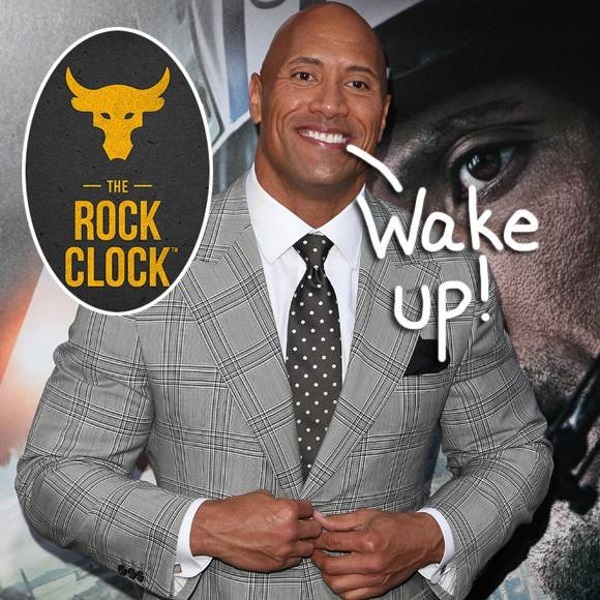 In an instagram post The Rock launched a video for his brand new app The #RockClock, an alarm clock app that does much more than just tell the time. Check out the video post below. The 100% free app is pretty bad a$$, but one of the coolest features is the personalized wake up alarms you can set. Choose from over 25 motivational alarm tones personally set by the “The Rock” himself. So tomorrow you could be waking up to the rock telling you to get your “candy a$$” out of bed, now that’s inspiration for you. It also features goal setting, where you place your goals on the interweb and the rock personally shouts you out when you reach them. Probably the best and worst thing about the clock app is that there’s NO snooze button. Life pasts you by one second at a time, and Rocky Johnson isn’t going to let you miss a minute. What do you guys think of” The Rock”s new app, corny or motivational?